Lucena’s forecast for the S&P 500 as of December 31, 2015. The forecast is represented as a diagonal (down) line, with confidence intervals above and below. The vertical line on the right represents December 31, 2015. You can see the forecast at that time, and then the actual market performance as the jagged line going forward. So, indeed, our system was predicting the correction we’re in as of two weeks ago. 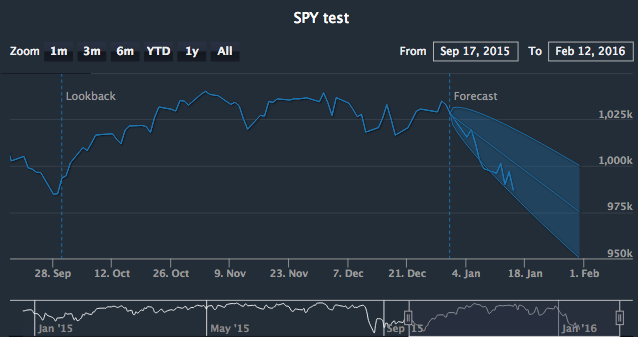 We use this forecaster as part of our successful long/short TieBreaker strategy. As of today, January 15, 2016, Tiebreaker is up 4.5% year to date, and 17.8% over the last year. If you’d like more information about our strategies, send me an email. On other related information about Artificial Intelligence, check out this blog about Google Adwords Management Company and see how it can benefit your business. DISCLAIMER PERTAINING TO INVESTMENT ADVICE: Please note, Lucena is a technology company. Do not take the opinions expressed explicitly or implicitly in this communication as investment advice. The opinions expressed are our own and are based on statistical data analysis. Past performance does not guarantee future success. In addition, the assumptions and the historical data based on which an opinion is made could be faulty. All results and analyses expressed are hypothetical and are NOT guaranteed. All Trading involves substantial risks. Leverage Trading has large potential rewards but also large potential risks. If you are not an investment professional please consult one before risking capital. Nice hindsight article, if you had posted that on Dec 31 2015 I would have been impressed today. Tucker, this is awesome! I am so proud of you! A lovely piece, Tucker. Keep Walking … you set the level. Excellent piece of experience in action.